I'm so excited about our new Oakberry Lane Collection!!! Come along as we head deep into the woodlands to explore the world of Oakberry Lane…the newest collection from Heartfelt Creations! Filled with delightful illustrations of lively, high spirited and lovable squirrels, this collection is one to capture your heart and creative imagination, and will appeal to both the young and the young at heart! Create irresistible outdoor themed scrapbook layouts preserving those precious moments experienced in the great outdoors, as well as charming handmade greeting cards ready to deliver well wishes and sentimental thoughts to friends and loved ones! Darling illustrations of squirrels at play on teeter totters and tire swings, gathering nuts, and bounding about in beautiful floral gardens with their tails held high, remind us that taking time to play, enjoying the company of others and banding together to make light work of the tasks at hand are important to a well balanced life! A stunning autumn themed color palette of acorn browns, woodland greens, sunset oranges, autumn leaf reds, along with deep plums and dark pinks, lay the foundation for decorative papers displaying delicate lace like patterns, vintage style barn wood patchwork backgrounds, as well as fascinating outdoor garden settings! Create your very own Oakberry Lane scenes with three cute and entertaining cling stamp sets and coordinating dies featuring a substantially sized acorn homestead, an assembling of lovable squirrels at play, and of course Oakberry Lane’s own signature wildflower blossom ready to be stamped, colored and assembled into a realistic 3D floral embellishment to accent all of your Oakberry Lane creations! So take a cue from our furry friends and make time to join in on the merriment! A creative adventure awaits you…we promise! Create a 5 x 7” hinged card base from Pearl Metallic Cardstock. Cut one piece of cardstock 6 x 7”, score on the long side at one inch. Cut the second piece of card 5 x 7” and using the Classic Border Basics decorative edge die, cut the front edge as shown. Adhere the two pieces of cardstock together using dries clear adhesive to create the card base. Round the corners. 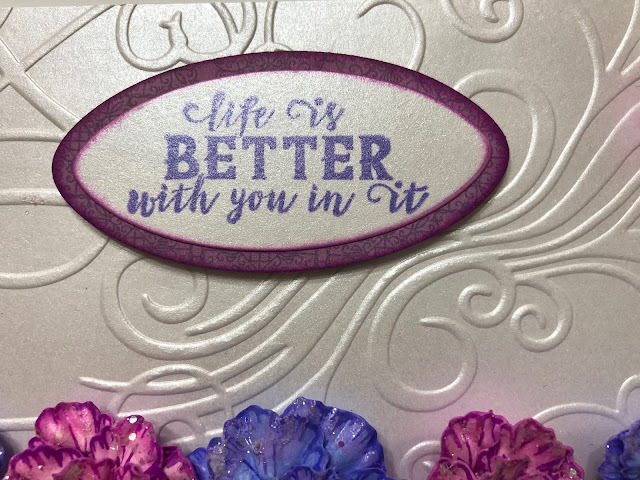 Using the plain edge from the Classic Border basics die, cut a mat layer from pearl metallic cardstock, round the top corners, place in embossing folder and run through the die cutting machine. Adhere to the card base using dimensional dots. Cut paper from the collection 4 7/8 x 6 7/8”, round the corners and ink the edges with cactus flower ink. Adhere to the inside of the card using dries clear adhesive. Stamp the Oakberry Lane Blossoms on Floral Cardstock using Archival Violet ink for the violet flowers and Archival Cactus Flower ink for the pink flowers. 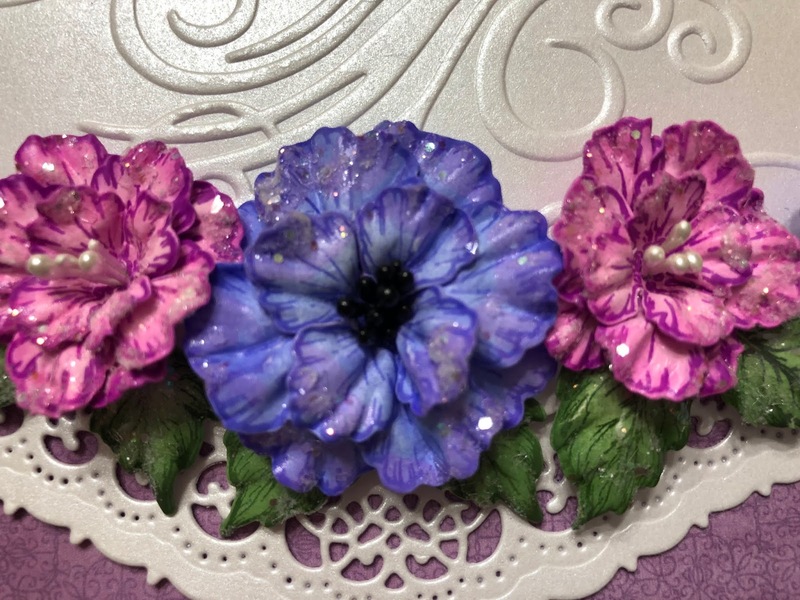 Color the violet flowers with the same color ink and the pink flowers with Archival Magenta Hue ink. Stamp the leaves on white floral cardstock using Archival Olive Ink, color using Archival Leaf Green and Olive inks and diecut the blossoms and leaves using the coordinating dies. 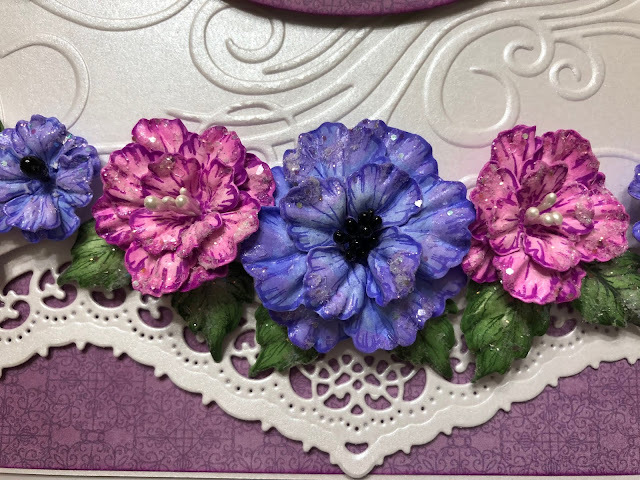 Place the flowers and leaves in the 3D Mold face down, spritz with water and run through the die cutting machine to shape. Finish off the blossoms by using the stylus from the deluxe flower shaping kit to press down in the middle. Adhere the flower petals together using dries clear adhesive. Use two petals the same size for the small blossoms and three petals for the medium and larger blossoms. (Use two the same size and one smaller.) Pierce the centers, insert the stamens and adhere the stamens using hot glue gun. 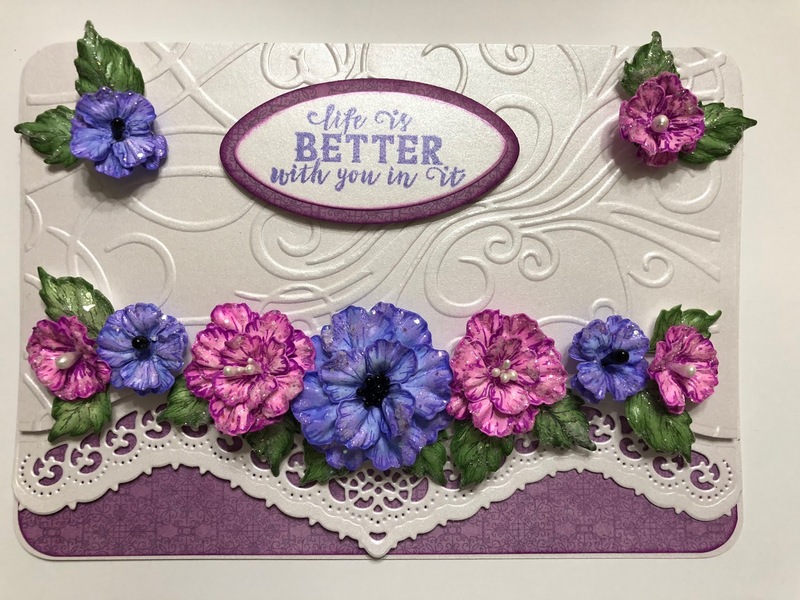 Stamp the sentiment on pearl metallic cardstock using Archival Violet ink, diecut using the Eyelet Oval & Basics Dies and ink the edges with Cactus Flower ink. Cut an oval a little larger from the paper collection, ink the edges and adhere the two ovals together using dries clear adhesive. Adhere the sentiment to the card base using dimensional dots. Using a paintbrush, paint the flowers and leaves with Distress Crackle paint and sprinkle with Rajni Chawla’s Crystal Clear glitter. Adhere the blossoms and leaves to the card base as shown using the hot glue gun. Use the Heat It tool to shrink any glue strings. Be sure to stop by the Heartfelt Creations Blog to see all the gorgeous and fun projects created by the fabulous design team. Your flowers are gorgeous Janet! Love the border shape too! Beautiful!